Need Bosch Vision 500 Series DLX WFVC645OUC 4.4 Cu. Ft. Front Load Washing Machine Review & Rating? The Bosch Vision 500 Series offers a few advantages over the Bosch Vision 300, in that it provides higher spin speeds at 1200RPM and a few extra wash cycles. Higher spin speeds equate to reduced drying times, ultimately saving on electricity costs. The most notable added cycle allows you to clean small loads (Minimally Soiled) in a blazing fast 20 minute cycle. The Bosch Vision 500 Series features both colossal capacity at 4.4 cubic feet and ultra efficiency, with total annual energy consumption estimated at an unusually low 130 kWh. At around $1,000 list, the Bosch DLX WFVC645OUC Vision 500 is a well positioned product given its feature set. Standout features include XxtraSanitary cycle which heats water to 170F helping kill 99.9% of most common household bacteria and allergens, high spin speeds (1,100 RPM) for shorter dryer times, 45 minute cycle time and virtually silent operation at 52 dBA. The Bosch Vision 500 is feature packed and a great value at its price point. #1) Near Silent Operation: Ultra quiet operation makes the Bosch Vision 500 washing machine ideal for second story installations or anywhere where additional noise isn’t welcome. Part of this can be attributed to Bosch’s proprietary AVS Anti-Vibration Technology. All this helps the washer operate at a near silent 52 dBA. User Reviews for the Vision 500 generally comment on the washer quiet operation. #2) Great User Reviews: Most Bosch Vision 500 reviews are positive, praising low noise, great value, colossal capacity and quick cycle times. Expert Reviews are also extremely positive; helping the Bosch Vision 500 receives multiple awards including a Good Housekeeping Seal. #3) Great Cleaning: Intelligent sensors help make this washer a consistent performer. Families with young children will certainly appreciate this washer’s ability to wash at 170F. These temperatures help the Vision 500 achieve NSF Certification and ensure the elimination of 99.9% most common household bacteria. An allergy rinse cycle also helps get the very last remnants of detergent out of washed clothing, helping reduce potential irritants. #4) Very Energy Friendly: Bosch overall was voted the 2009 ENERGY STAR partner of the year. 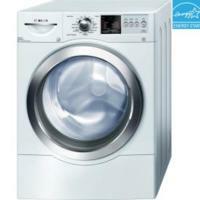 The Vision 500 washer exceeds ENERGY STAR 2011 guidelines and uses only 130 kWh/yr. Bosch’s ActiveWater system essentially turns 13 gallons of water into 400 gallons of washing power helping make Bosch become the most water efficient washer brand in the U.S. The machines efficiency also helps contribute to its super quick cycle times of only 45 minutes. For smaller loads a special cycle, not found in the Vision 300, allows smaller/less soiled loads to wash in 20 minutes. #5) Large Capacity: At 4.4 cu. ft. the Bosch Vision 300 will have no trouble tackling large family demands, including multiple towels or king sized comforters. The Bosch Vision 500 washer was built to balance these large loads for continued quiet operation. #1) User Interface: The controls are electromechanical and are less sophisticated then other models we’ve reviewed. #2) Styling: More style conscious buyers may not love the Vision 500’s bland styling and color options. It all depends on where your washing machine will be installed and your level of style consciousness. The Bosch Vision 500 Series DLX WFVC645OUC 4.4 Cu. Ft. Front Load Washer is a solid washer at the $1,000 list price point and will go head to head with any other offerings at this price. If you’re looking to save a few hundred dollars and get basically the same functionality, take a look at the Bosch Vision 300. As mentioned the Bosch Vision 300 has 100 RPM slower spin and a few less cycle options.